Although most injuries occurring on ships occur before passengers and crew members seek medical treatment, injuries occasionally occur as a result of the medical treatment itself. The majority of these cases involve medical treatment received on the ship from the ship’s doctor or other medical personnel. Some also involve medical treatment that occurs after the passenger or crewmember disembarks, or is airlifted off the ship. Virtually every cruise line maintains an onboard hospital or infirmary to treat injured passengers and crew members in the event of injury. The size and quality of these facilities and their staff vary, as does the medical equipment they carry. Most shipboard medical personnel reside outside the United States and are hired on a contract basis. Moreover, because shipboard infirmaries are designed to handle minor ailments, and not catastrophic or life threatening medical problems, most shipboard doctors are not trained specialists or board certified in a particular area of medicine. A cruise line’s responsibility for the medical negligence of its shipboard doctors and medical staff depends heavily on whether the injured person is a passenger or a crew member. A cruise line has a duty to crew members and seamen it employs to provide prompt, adequate, and appropriate medical care. This duty arises from the relationship between the employment relationship between the cruise line and the crew members. As a result, if the ship’s doctor or medical staff are negligent in their care and treatment of members of the crew, the cruise line is liable for the medical staff and doctor’s negligence. The cruise line is also liable for injuries resulting from medical negligence that occurs off the ship if the cruise line refers the crew member to a land-based doctor or medical facility for treatment. Unfortunately, the law is not the same when it comes to passengers. 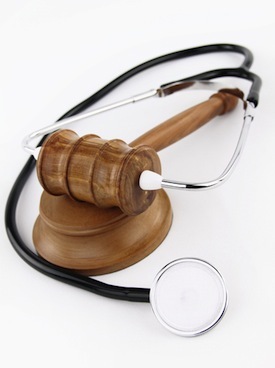 As a general rule, a cruise line is not responsible for the medical malpractice of a ship’s doctor or other medical personnel on passengers because they are not an employee, or legal agent, of the cruise ship. Although many courts have recognized that this rule is outmoded, because of the size of the cruise line industry and the realities of modern day cruising, most courts that have declined to deviate from it until Congress or the Supreme Court change the law. As a result, passengers who are injured by the medical negligence of a ship’s physician are normally required to sue the doctor or nurse responsible for the error directly – an extremely difficult process, since many of the doctors and nurses live overseas and do not carry malpractice insurance. Nevertheless, a number of courts have recognized an exception to this rule where the ship holds the doctor or member of the medical staff out to be an agent of the ship, and the passenger who received medical treatment relied on the ship’s representations concerning this matter, a doctrine known as “apparent agency.” In addition, some courts have also found that a cruise ship may be responsible for injuries to passengers based on medical treatment if the representations made by the cruise ship in their passenger ticket or website are untrue. Our Miami firm was involved in arguing this issue in the Florida Supreme Court on behalf of a girl who suffered a ruptured appendix as a result of the negligence of a shipboard doctor, and has played a major role in attempting to change the law to make cruise lines responsible for the medical negligence of shipboard doctor’s on passengers. We also have been successful in convincing several federal courts to recognize the doctrine of “apparent agency” in cases where passengers are injured by ship’s doctors. If you or a family member has suffered an injury as a result of medical malpractice or negligence on the part of a ship’s doctor, call our office to schedule a free consultation.